The Miracle of NOW... Merry Christmas 2011! In December of 1962, I was in the first grade at Huron Park Grammar School in Roseville, Michigan. Between our house and the school was a six-block maze of nearly identical three-bedroom homes that sprouted up fifteen years before to accommodate the coming Baby Boom. It was the accessories that made the sturdy little houses distinguishable--shrubbery (there was not enough yard to call it landscaping) the painted trim and shudders, an awning over the concrete porch, the family car in the driveway, and of course, the address beside the front door. Ours was 18140 Buckhannon. A decade and a half before, as the developers built the brick homes after the war, they also planted an elm tree in the center of each yard between the street and the sidewalk. Only the homes with a fire hydrant in that spot did not have a tree in that spot. Had they been oak trees or some other hardwood, they would have still looked like saplings after fifteen years, but these were elms, fast-growing shade trees chosen for that very purpose so that while the houses still looked somewhat new the neighborhood itself looked settled in the rhythm of the seasons. The elms kept sentinel watch along the streets all summer long as bikes and wagons and strollers passed beneath. By late September their shade gave way to falling amber leaves. And by winter, the street-side trees stood nearly forgotten, invisible above with dark trunks spotted white from snowballs that we threw on our way to school anc\d home again. Each morning, after oatmeal bowls were stacked in sinks and ,one by one, the family cars took fathers off to work, kids of all ages came bounding out the front doors to the shoveled sidewalks, heading east in sibling pairs and groups of friends that grew and split like cells the closer we got to Huron Park. My sister Kathy and her friends wore matching things and stylish boots. My brothers and I were bundled up as if for play in motley scarves and mitts and stocking caps. We clumped down the walk in black boots--the kind worn over shoes passed down from child to child through families so that typically the oldest boy’s looked new. They had bend-over tongue and slot buckles that would get so encrusted with ice and snow we had to kick at each others’ ankles at the back door to chisel the buckles free. I being the youngest had the boots already worn and worn out by Paul and Dave. There were patches on them. It’s true. The year’s of sledding and kick ice from the buckles had taken their toll, and Dad had mended rips here and there with the same rubber patches he used on inner tubes. The tongues of nearly all the bend-over buckles were broken off years before so that now we tied them tight with tourniquet shoelaces. I thought nothing of the my raggedy boots because even when new (and I don't recall ever seeing a pair as new as this picture), there is nothing frumpier looking than black overshoes bought one-size too big for growing into, which was always how our mother bought things. 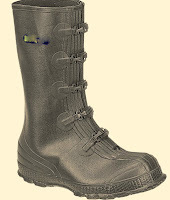 What mattered was my boots kept my feet dry, and the patches made my boots easy to find before recess. And so it was, in ways I didn‘t notice at the time, I learned the art of family life, of getting by and making do and feeling fed and dry and warm as each day passed around us. I lived in that neighborhood with the elm-shaded streets from kindergarten to college. What happened at school I don’t much recall. It is family not school that brings meaning to life. In its most important role, school simply provides a time and place where the rest of life soaks in. I’m sure I learned whatever teachers taught in much the same way pancakes absorb syrup. I chose to begin these thoughts in 1962, because that is exactly 50 years ago, a half century. President John F. Kennedy was completing his first year in office. Just two months before that Christmas season, something called “The Cuban Missile Crisis,” but I remember nothing of it from the time. I was in first grade, and knew little of what went on beyond the tightly-woven streets between my house and Huron Park. We watched TV of course, but I never paid attention to the news. (The first "news event" I recall watching on TV would happen in November of 1963, but I'll get to that in later chapters.) Think about this when you think about the elms, and the Boomers, and coming of age of telelvision. 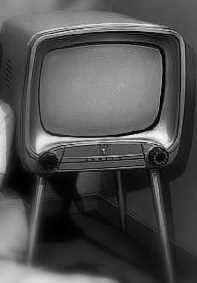 When the elm trees were planted, the number of TVs in homes in the United states was less than one million (circa 1949). Twenty years later, there were 44 million U.S. homes with TV sets, and today there or 115 million homes with TVs--and the average American home has more televisions than occupants. And this does not factor in the multiple other electronic devices now available to families. I mention these statistics only to give some context to the following television event from 1962. That year on NBC, the very first animated Christmas special was aired. It was called Mr. Magoo's Christmas Carol. I highly recommend watching all of the parts to this classic on Youtube, but for now simply imagine a family of six sitting in front of the one TV in their house. The television itself is about ten years old. The special was broadcast "in color" but it would be another decade before our family had a color TV. We were content to watch this and all the other Christmas specials of the Sixties in black-and-white. May the message of this scene and song bring meaning to your home this Christmas season. If time is factor, begin at the 4:30 mark for the segue to the song. Mother: And how did Tiny Tim behave? A Christmas far more glorious than grand. And prize what we have now. The miracle of … now.